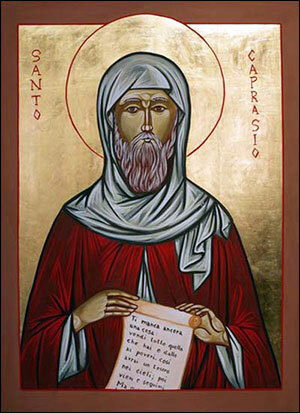 Saint Caprais, sometimes called Caprasius, came from an illustrious family and had studied philosophy and literature before leaving everything behind to live in solitude in the mountains of Lérins, Provence. He was joined by Saint Honoratus and Honoratus' brother Venantius there; Honoratus and Venantius were two youths who wished to become hermits as well. They submitted themselves to the older Caprais and the three decided to go on pilgrimage to the Holy Land and visit the holy places of Palestine and the lavras of Syria and Egypt. They arrived in Marseilles, where they became acquainted with Bishop Procule (381-428), who tried to retain them in his diocese. The three cenobites then embarked on the Aegean Sea, where those on the ship did not know Latin, in order to live there incognito. At Nicomedia they added Saint James, a newly-baptized Persian. Their journey finally brought them to the Peloponnese. However, Venantius died at Methoni in Messenia and Caprais and Honoratus cut short their voyage. Caprasius and Honoratus made their way back to Gaul. They were loved in Italy, but they continued to Provence where they befriended Saint Léonce, Bishop of Frejus. In order not to be far from this man of God, they looked for an isolated place: Saint Léonce first proposed a cave to them at Cap Roux, but soon the hermits are solicited by the population who interrupted their prayer. Saint Léonce then led them to the Lérins archipelago around 391, where they wished to imitate the Desert Fathers. There they were joined by many others, and the hermits were inspired by the monastic rule of Saint Pachomios the Great of the Thebaid. Lérins Abbey grew up on the site of this community. According to one scholar, Caprais may not have been the official leader of the community at Lérins, since he may have been advanced in years at this time or else lacked the charisma of Honoratus. Thus Honoratus, with the agreement of Saint Léonce, became the abbot and founder of Lérins, while Caprais continued to give advice to his new superior, especially for the drafting of the Rule, and devoted more freely to prayer for the sanctification of the community. Honoratus first tried to destroy the temple to the demi-god Lero. We do not know to what extent the elderly Caprais was able to collaborate in the construction of the church and the monastery, if not by the support of his prayers. As for food, it consisted, according to the report of Saint Cesaire, of herbs and a cooked porridge for the week. Saint Honoratus, having miraculously chased away the serpents of the archipelago, it could not long escape the knowledge of the mainlanders who knew very well that the archipelago was infested. This miracle, and others accomplished by Saint Honoratus, increased the fame of the monastery to all the Gallo-Roman peoples. The sick or other needy were soon to visit these islands favored by grace. The Burgundians having invaded the Viennese province in 413, Saint Honoratus took some monks to evangelize the coasts of the Rhone and Saone. In his absence, we can think that Saint Caprais assumed the position of Abbot until the return of Saint Honoratus around 420. 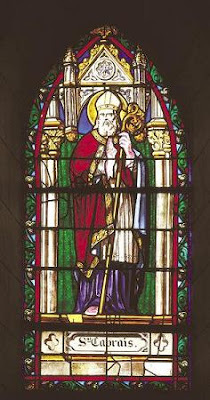 Saint Hilary of Arles and Theodore, Bishop of Frejus, having known that Saint Caprais had become ill, came to venerate him and seek his prayers. Saint Caprais died on June 1st, 434. His body was still preserved under Louis XV in Lérins. Hilary of Arles, who had been a monk at Lérins before becoming Bishop of Arles, composed a laudatio in honor of Caprais after the latter’s death, which is the main source for Caprais’ life. Now, what remain of his body is preserved in the Abbey of S. Caprasio, in Aulla, north Tuscany. Caprasius should not be confused with another French saint of the same name, the martyr Caprasius of Agen.